NOTE : Activation key must be used on a valid Steam account. 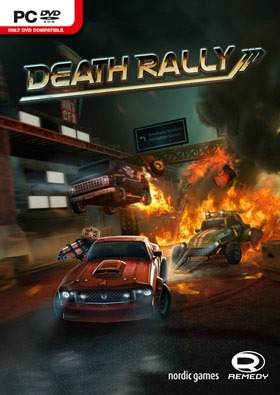 Requires internet connection.ABOUT THE GAME“Death Rally” is a top-down racing game with theobjective to win races, gather more money, buyupgrades to your vehicle. And all this while wreckingyour opponents, shooting your way throughbystanders and keep the pedal to the metal! Gun the engine and load your guns – the classicis back!R… emedy’s very first game is now bigger,stronger and more vicious than ever. Make a run forthe finish line with a trail of burnt rubber and spentbrass behind you… along with the flaming wreckageof any fool dumb enough to get in your way. This is not a Sunday drive. This is DEATH RALLY. KEY FEATURES Massive single player career mode, unlock and upgrade cars, weapons and challenges Enormous online multiplayer campaign ROAD WARS! Friends play, battle modifiers, unique paint jobs, and a whole lot more! Awesome controls with 2 camera angle options	Featuring guest drivers – DUKE NUKEM, BARRY WHEELER, JOHN GORE SYSTEM REQUIREMENTS Minimum System Requirements: OS: Windows XP SP2 Processor: 2.6 GHz single core Memory: 1 GB Hard Disk Space: 3 GB Video Card: DirectX 9.0c compatible graphics card DirectX®: 9.0c Sound: Integrated audio interface Additional: Notice that the game does not run on mostof the integrated video cards such as Intel GMA. Italso requires at least 256 MB of video memory to runsmoothly. Recommended System Requirements: OS: Windows 7 Processor: 3.0 GHz dual core Memory: 2 GB Hard Disk Space: 3 GB Video Card: GeForce 8 series, ATI Radeon HD2xxx DirectX®: 10.0 Copyright 2010-2012 Remedy Entertainment Ltd. All Rights Reserved. Death Rally is a registered trademark of Remedy Entertainment Ltd.